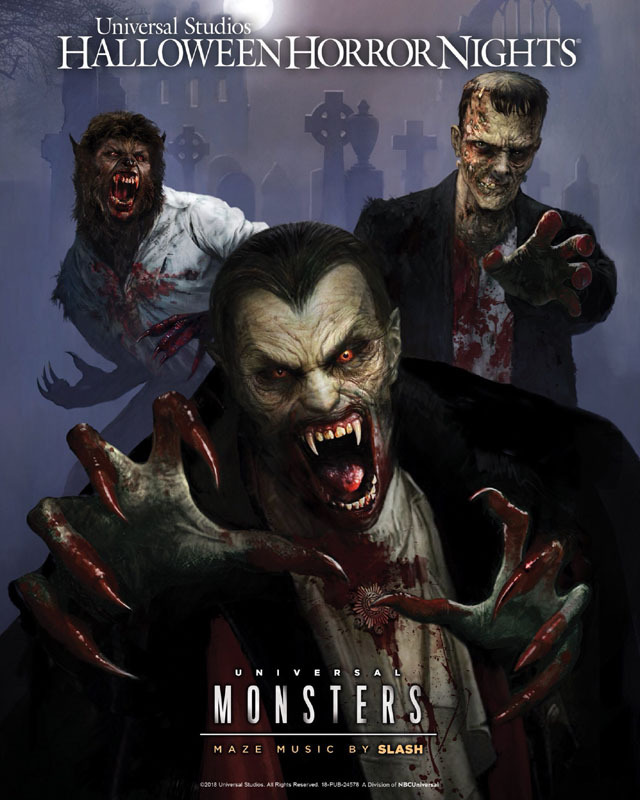 Universal Studios’ Hollywood theme park has announced its final maze for this year’s incarnation of the annual Halloween Horror Nights event, reuniting the iconic Universal Monsters, including Dracula, Frankenstein, The Wolfman, and many more, set to a musical score composed by legendary guitarist Slash. Inspired by Universal’s legendary horror films, the Universal Monsters maze—featuring an original score produced and composed by Grammy Award-winning musician, Slash—will shake horror fans to the core with a petrifying modern rendition. The Universal Monsters maze is the final reveal for 2018 at the Hollywood park, while The Horrors of Blumhouse, unites Happy Death Day and The First Purge at the Orlando park and Truth or Dare and Unfriended in Hollywood. These follow the previously announced Halloween 4, Trick ‘r Treat, Stranger Things, The Purge, and Poltergeist 2018 attractions, among others.